This category is for posts by or about our community Disaster Preparedness Group (911). This afternoon we flew past SV and snapped pix of the drainage area above San Vicente. Here’s a wide shot. Our main drainage is the small creek running up the center slightly toward the right. 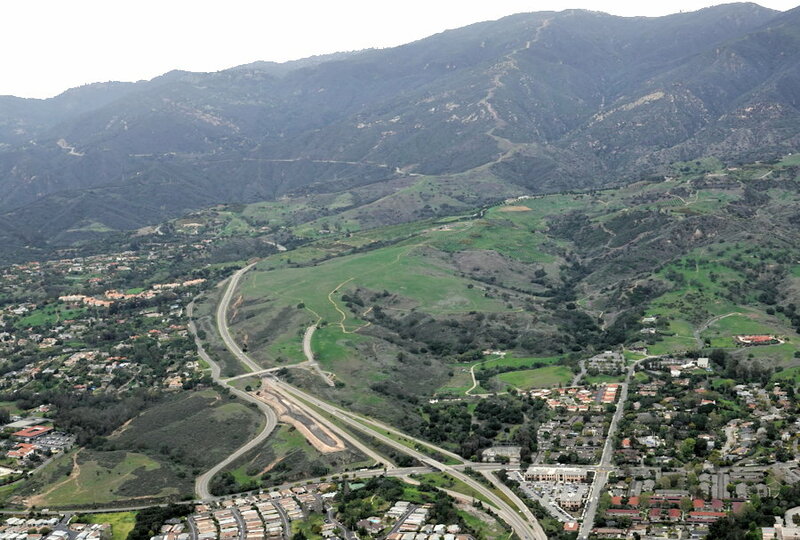 The main drainage from the mountains runs to the left behind the top of that first low hill of the San Marcos Foothills open space. In a major flood that’s where the vast majority of runoff would go. Even if SM Foothills was burnt bare, any debris flow would be relatively minor here at SV. You can also see the smaller channel that drains to Cathedral Oaks from the left side of the pic. Also potential for flow down 154 that would collect below the overpass. All that water drains through the culvert that feeds the channel through our open space. In a major flood that would overflow and/or get plugged by debris so the water would then spread out and head downhill, probably mostly along roads as it spread out beneath the overpass. A closer look shows how our main creek leads down to the Foothill/154 underpass. There, in event of an overflow at the inlet to our culvert, the electrical substation might be impacted. That whole area would flood, and eventually some might enter SV and/or begin to flow to the left on Cathedral Oaks and/or right on Foothill. This seems to match the small SV flood risk areas on the map published here related to the 2015 El Nino prep meeting (click to view). Some of our streets might flow with water and Rancho next door might be more impacted in such an event. For frequently updated info on the current major rain event and flooding potential sign up for SBitZ.NET and Edhat, and watch KEYT on channels 3.1 and 3.2 or online. Information submitted by: Bob Enderby, DPG, Coord.